By Keith Cowing on January 31, 2008 11:20 AM. "The National Aeronautics and Space Administration could use a Space Act agreement under that agency's "other transactions" authority, and was not required to use a procurement contract, for the development and demonstration of a space transportation system, where the principal purpose of the announcement was not to acquire goods or services for the direct benefit of the agency, but to stimulate a public purpose authorized by law. By Keith Cowing on January 23, 2008 4:00 PM. "If our new system could carry only people into space, that would be enough for me, because of the transforming effect it will have on the thousands who will travel with us. It is quite clear from every astronaut that I've ever spoken to -- including Brian Binnie and Mike Melvill -- that seeing the planet from out there, surrounded by the incredibly thin protective layer of atmosphere, helps one to wake up to the fragility of the small portion of the planet's mass that we inhabit, and to the importance of protecting the Earth." 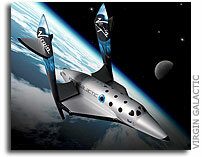 "Virgin Galactic today unveiled the design of its new, environmentally benign, space launch system based on the X Prize winning technology of SpaceShipOne, which successfully flew into space for the third time in October 2004 and won the $10m Ansari X Prize. The construction of the White Knight Two (WK2) mothership, or carrier aircraft, is now very close to completion at Scaled Composites in Mojave, CA and is expected to begin flight testing in the summer of 2008. It is the world's largest, all carbon composite aircraft; it has a unique high altitude lift capacity, capable of launching SpaceShipTwo and its eight astronauts into sub-orbital space flight." By Keith Cowing on January 18, 2008 1:00 AM. "Google Chief Executive Eric Schmidt on Thursday suggested NASA could learn a few things from his company. Speaking at a luncheon series to commemorate the agency's 50th anniversary this year, Schmidt urged the space agency to take after what Google attempts to accomplish with its products: Build open, collaborative systems, not closed ones--a reference to NASA's legacy of creating mission-specific vehicles. Create simple platforms upon which others can build. And while you're at it, why not let spacecraft talk to each other?" By Keith Cowing on January 9, 2008 11:37 PM. "The winners of the 2007 Pete Conrad Spirit of Innovation Award will be recognized at NASA Headquarters in Washington, D.C. on January 18, 2008. NASA will unveil a Spirit of Innovation traveling exhibit, and the X PRIZE Foundation will announce plans for the Conrad Award Scroll to be carried to the International Space Station in the fall of 2008." By Keith Cowing on January 9, 2008 4:39 PM. "Alliant Techsystems (NYSE:ATK) announced that it has negotiated definitive agreements with Canadian-based MacDonald, Dettwiler and Associates (TSX: MDA), to acquire its Information Systems and Geospatial Information Services businesses for $1.325 billion (CDN)." "Yesterday's acquisition of Canada's MacDonald Dettwiler and Associates (MDA) by Alliant Techsystems (ATK) is bad for Canada for so many reasons. It's reminiscent of when Avro Canada closed down and most of their talent headed to the US and were instrumental in helping them with the Apollo program." By Keith Cowing on January 3, 2008 10:32 PM. "Former astronaut and retired Navy Commander John Herrington resigned Dec. 21 from Rocketplane Global, Inc. "I was fortunate during my tenure at Rocketplane to work with an incredibly talented group of professionals," said Cmdr. Herrington. "My decision to leave was a difficult one." By Keith Cowing on January 2, 2008 5:05 PM. "NASA has awarded a contract to Zero Gravity Corporation of Las Vegas to manage and operate an aircraft to perform reduced gravity parabolic flights while carrying NASA-operated experiments and personnel. The parabolic flights will provide the means to replicate the reduced gravity environment of space for various areas of research needed to further NASA's understanding of space travel. These include aeronautical research, fluid physics, combustion, material sciences and life sciences." This page is an archive of entries in the Commercialization category from January 2008. Commercialization: December 2007 is the previous archive. Commercialization: February 2008 is the next archive.